This religious tapestry "Resurrection" is of remarkable beauty is based on the work of Pietro Perugino (1450-1523). He was an Italian Renaissance painter of the Umbrian school, and one of his pupils was Rapahel. His works have included frescos in the Sistine Chapel, paintings which are now in the Louvre and works of religious nature which has inspired generations of artists since. This work, whose full name is "San Francesco al Prato Resurrection" shows Jesus resurrected, holding the crusader flag with two angels at his sides, which are symmetrical in shape, but with different colored garments. The sarcophagus is painted in geometrical perspective style, with the lid exposed, and soldiers are seen here with their garments and detailed crest of the helmet. behind is a landscape with lake and trees. The original is in the Pinacoteca Vaticana, Rome. 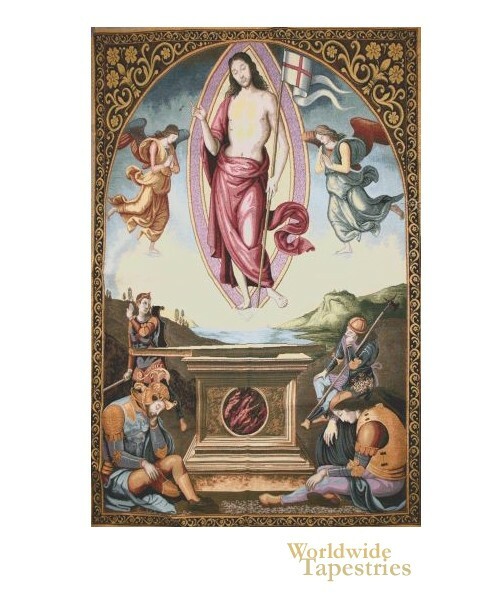 This religious tapestry "Resurrection" is lined and has a tunnel for easy hanging. Dimensions: W 25" x H 36"
Dimensions: W 36" x H 50"